Would you pay $26 for okonomiyaki, a Japanese pancake of flour batter? We did and then requested to see the chef! 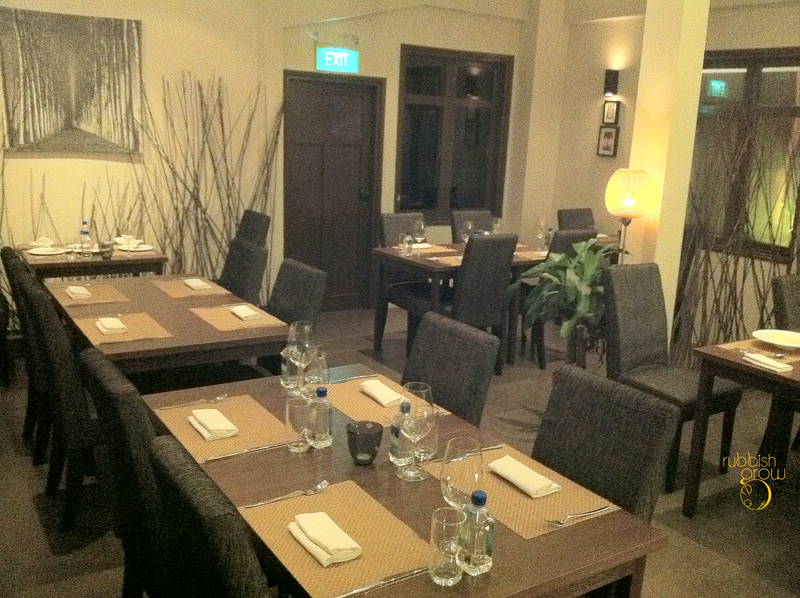 Decor: The white-and-black colonial building has two areas: the indoor dining, which is Zen-inspired but rather staid, accented by colors like gray and browns. 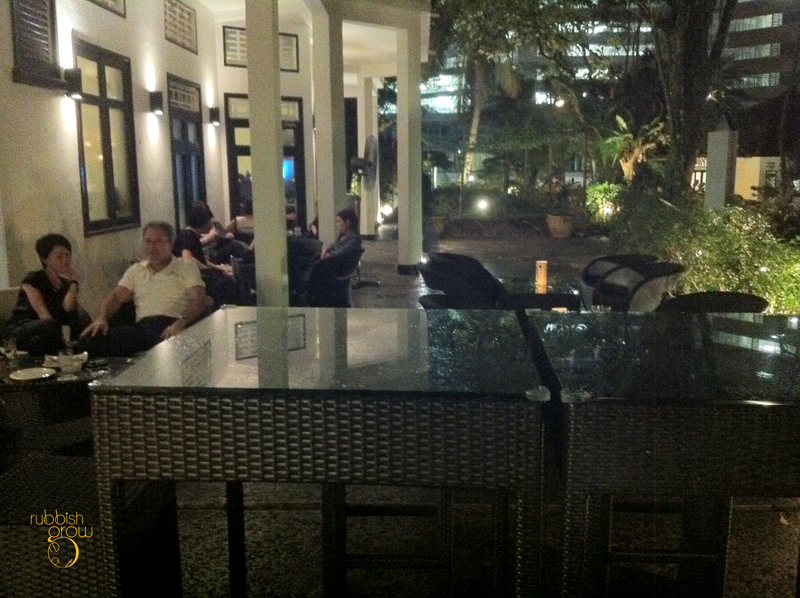 The al fresco sitting is completely different: relaxing with rattan furniture and a cool bar on the left of the building. 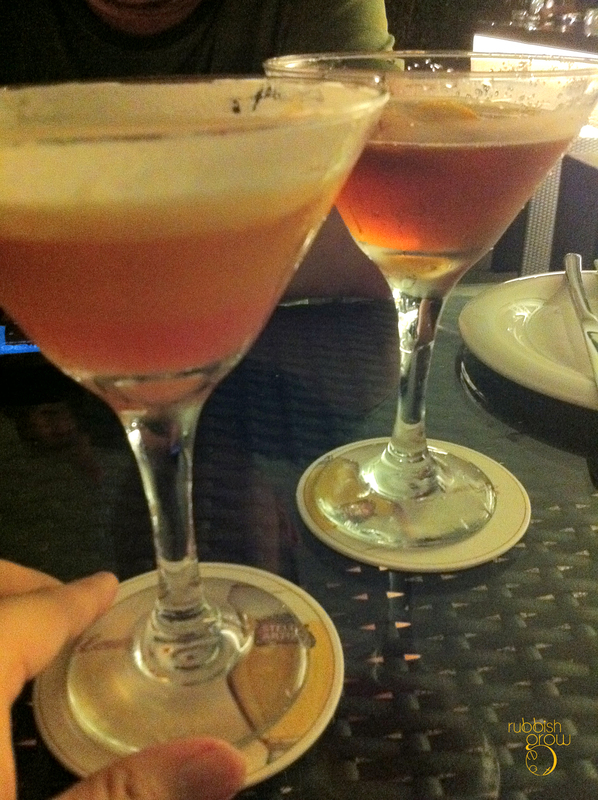 We ordered two of their specialty cocktails: black tea martini ($22, black tea gin infusion, fresh lime, rose syrup) and healthy indulgence ($24, earl gray infusion, pear vodka, soupsop, rockmelon, fiber jelly). The ingredients sound amazing, fresh, tangy and fruity but in reality, the cocktails fall short of the steep price tag. The alcohol drown the tastes of fruits and flowers. The cocktails are okay but not great. 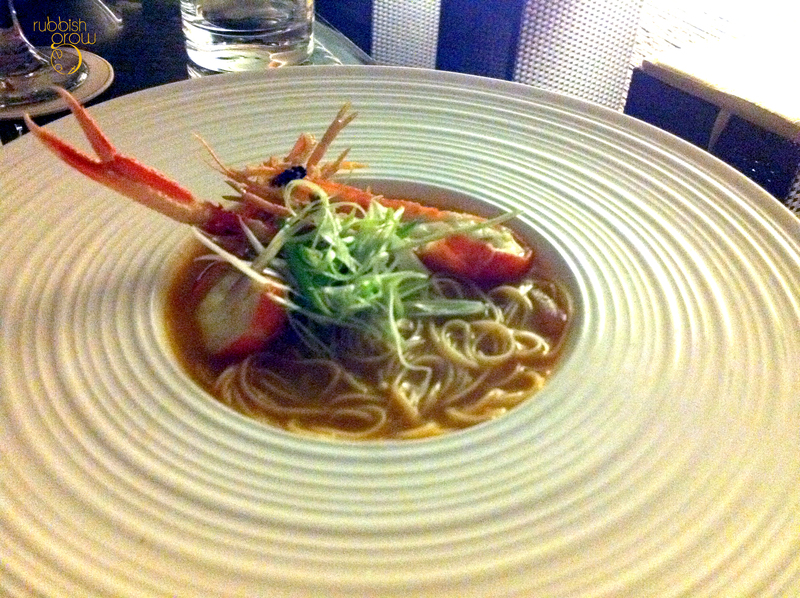 Gorgeously plated like an oasis in Sahara, but can the Scampi Somen ($28) be any smaller? Small but stupendous. 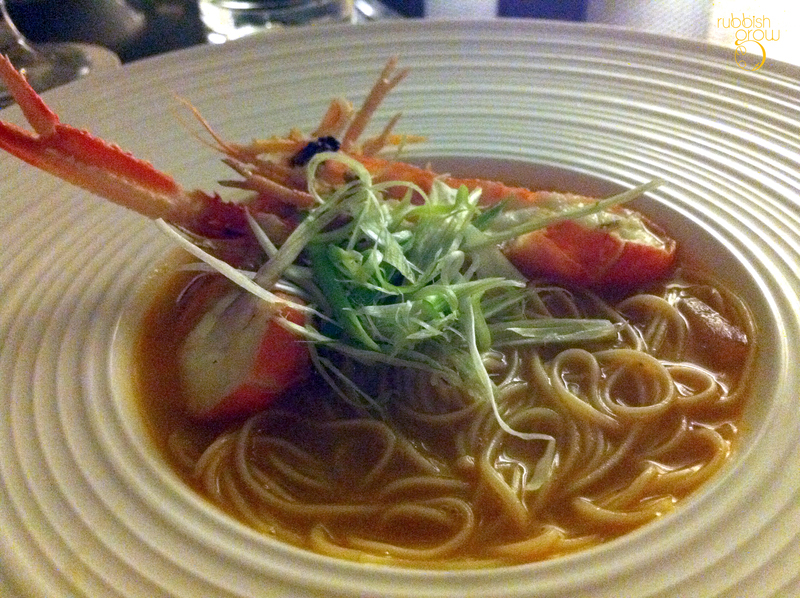 Somen, which is anorexic Japanese noodles made of wheat flour, has a hint of seaweed, in a sea of lobster broth with scampi, a cross between a small lobster and a big prawn. The somen is silky, slurpilious. And the light broth is surprisingly robust, bursting with flavors, but without the sickening greasy excessiveness of ramen broth. Titillating and orgasmic! Spicy miso butabara ($26) is grilled pork belly in spicy miso, served with potato croquette and salad. Executed excellently in its own right, but when compared to the somen, it pales in comparison. 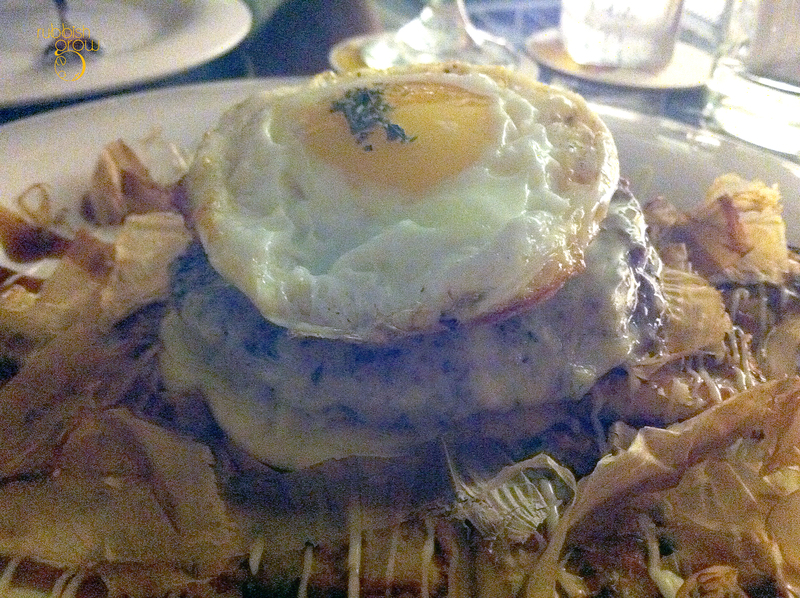 A hot mess of $26 angus beef okonomiyaki topped with a sunny side-up. The angus beef is a patty but the scene-stealer is without a doubt the Japanese pancake, the best we have in our lives. Besides the four common tastes, sweet, sour, salty and bitter, there is a fifth taste, umami, that brings about all the tastes in perfect harmony and balance. Umami, I believe, is the secret taste that gives you the orgasmic feel. And truly, this okonomiyaki is umami-lious and is worth every penny. A simple Japanese street food, a dish with humble origins, gave us pure, simple, unadulterated joy. That goes to show: never look down on anything or anyone. Look at Spiderman who was a nerd. Or Captain America who was weak. 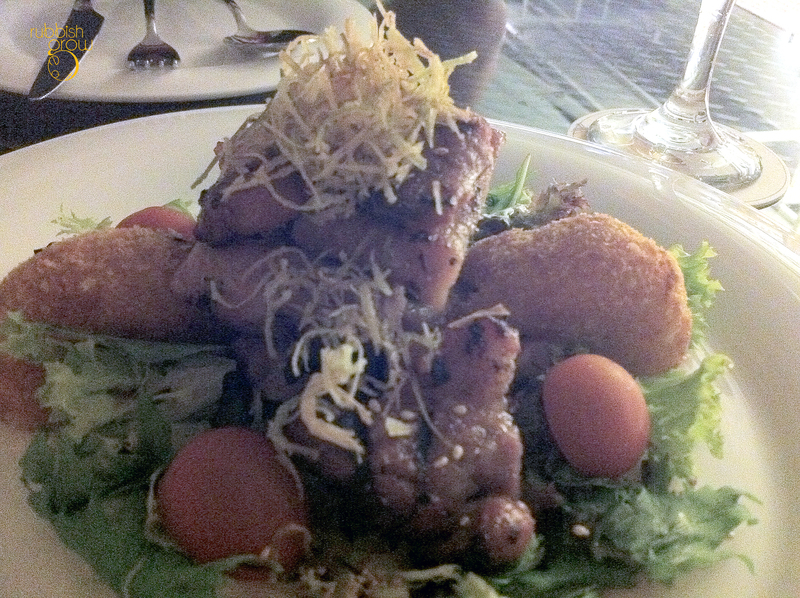 Because of this dish, we asked to see the chef. We simply had to pay our compliments. The kitchen is helmed by Chef Joseph Wee whose resume includes Goodwood ParHotel, Meritus Mandarin Hotel and Majestic Restaurant. But it was Chef Michael, sous chef, who was cooking our food. Big thank you to Chef Michael for the wonderful food. 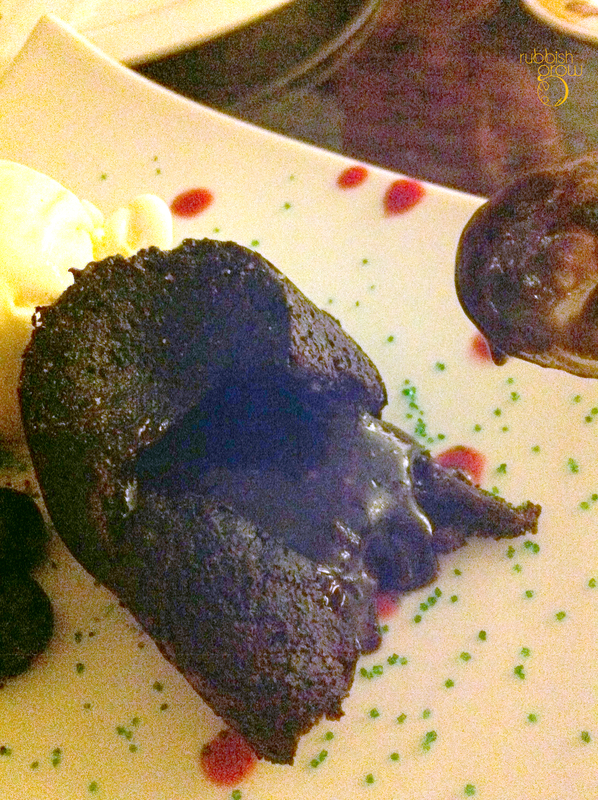 Chocolate lava ($12) ended the perfect meal with a perfect bang. Piping hot, the chocolate was thick and dark, paired with a rich vanilla ice cream. 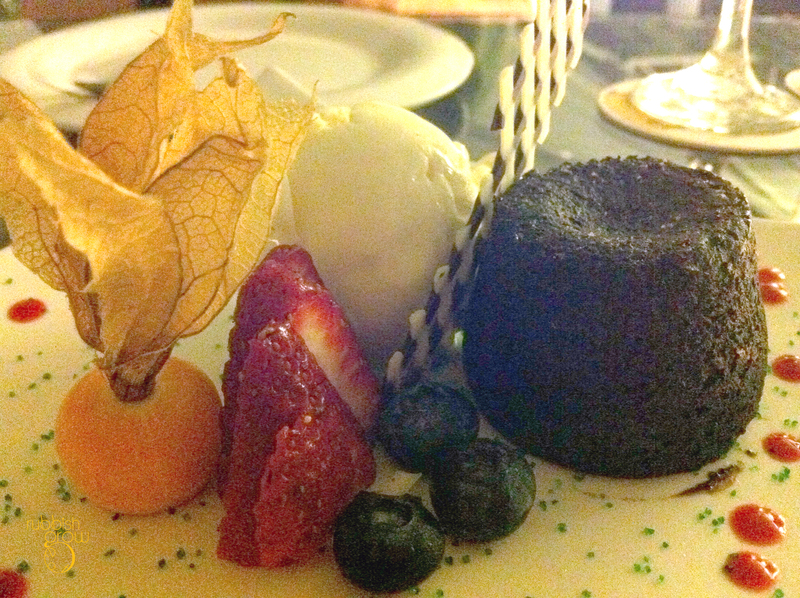 One of the better lava cakes in Singapore. Service: For the first time in our lives at a restaurant such as this, a server spoke to us in Mandarin, which made us laugh. His chumminess works for us–because we are friendly people–but other customers may find him presumptuous. 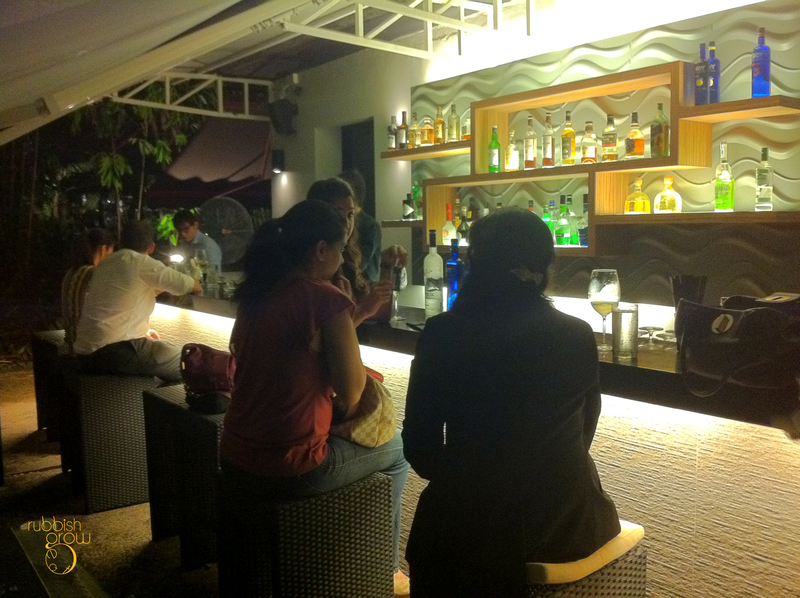 We like the casual and mostly attentive service but the service is not for everyone. 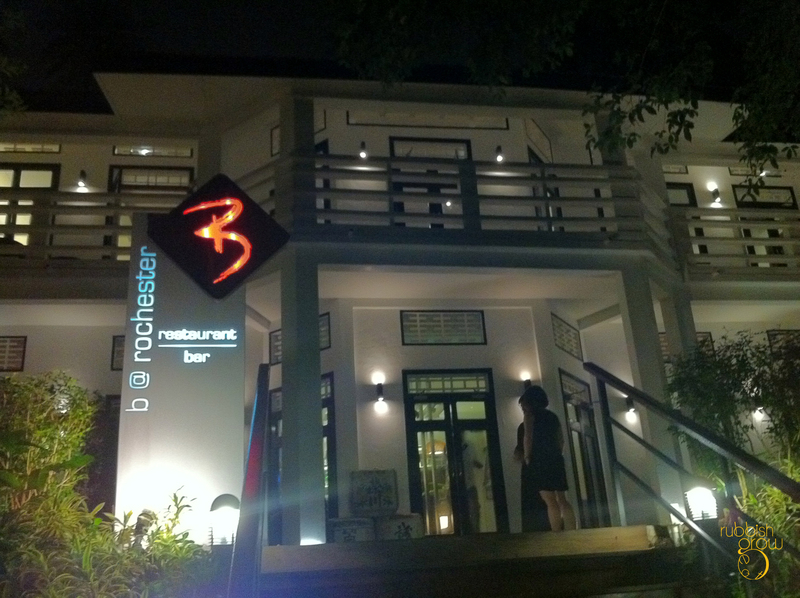 We don’t give a rating of 4/5 easily but this is one of the best food we have had this year. Not a cheap meal by any account, we paid $162.43 for two or $81.22 for a person. We left broke but contented. wow, thats an expensive meal! But sounds worth it! How come you can stay till 1am when the opening hrs state 6-11pm? I think the bar allows patrons to stay late. I was there last Friday for dinner too! Was that the same time you were there?? nah, we were there months ago. We have a lot of backlog. Too many restaurants, too little time. Been there for drinks but never tried the food. Looks like it is worth to make a trip down again for the food. must go for food. One of the best food this year. Definitely one of the best! Pity they didnt have salmon belly today but still the salmon and tuna was enjoyable. Tried the okonomiyaki. It was good but perhaps they could be more generous with the pancakes considering the size of the beef! Pidan tofu was heavenly omg im still hallucinating about it now. Your rating is definitely justified!